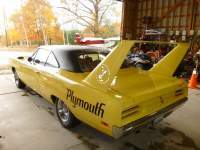 DodgeCharger.com Forum > Discussion Boards > Aero Cars (Moderators: Chryco Psycho, hemigeno, firefighter3931, Charger-Bodie) > Wing Color? Been trying to figure out..does a Daytona fender tag offer any info regarding the wing and decal color? Or is that only known from the broadcast? I believe it is noted on the Daytona "ship list"
But where did that info come from? Think the blanks were scheduled production units that didn't happen.. I don't think the complete run of Daytonas, or Charger 500's, were one long continuous string of sequence numbers. Helpful, somewhat hard to read, but I don't see mine on there. I believe he was telling you to give him your VIN and he'd look it up! Glad I checked, I was going to go with white due to it showing under the black surface paint as seen in the pic back two years or so just before the restoration started. But I never dug under the white, thought it was original. Thx! Both quarters have been replaced, but I still have the old ones, will check them over. Thx! A Daytona's wing/stripe color is not listed on the Fender Tag, Broadcast Sheet, or even the Daytona Shipping List. The only reference is on the aforementioned Dealer Invoice list. The spreadsheet was created and published by the WW/NBOA, apparently from Chrysler's own Dealer Invoice archives that the club obtained or to which they were given access. Right after the first installment was published in the newsletter, I asked Sue if they were going to publish the original document also, and she said no - it was too hard to read... which I understand. I offered to go through the original document and the spreadsheet that Sue created, to help catch some of the spreadsheet's typos and make a few other corrections I had spied myself. Sue was extremely kind to me and sent a copy of the actual spreadsheet itself - which I admittedly spent several days geeking out while going through the list character by character. I would still love to spend some time with the source document if the opportunity ever presented itself. While the WW/NBOA's spreadsheet is by no means bad or completely unreliable information, it is not a photocopy of the original document like the Daytona Shipping List which was published in the WW/NBOA newsletters several years earlier. I've done some spot checks of the Invoice list for stripe colors of cars whose history I know about, and the stripe colors listed do appear to be fairly accurate... but I still would not consider this as-published spreadsheet to be an unimpeachable source. First-hand observations of an unrestored Daytona, or pictures from when the car was new are more reliable sources. However, this list would be better than nothing if other information was no longer available. As for why some of the lines are blank, there's no definitive answer. I have my own theory, but it's worth no more or no less than anyone else's theory. My guess is that the list represents the orders received by Chrysler for Daytonas, and were then transferred into 926xxx - 927xxx VON's. The list in its published form was arranged by Chrysler's zone areas and not by the VON. 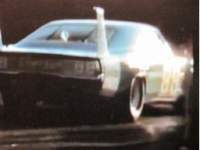 Knowing that the Daytona was not a moneymaker from an accounting standpoint, Chrysler's management went through the +/- 1,200 orders on the list and apparently selected only +/- 500 orders to be put into production. This list represents the cars which "made the cut" so to speak, and may have been based on the Zone Rep's input of which dealers were favored over others, whether it was a firm order or even an ordered/sold car, etc. There are several great pieces of information embedded in the list, such as how many Daytonas a particular dealership (likely) ordered, vs. how many they received. Some cars were ordered and then re-assigned to another dealership for whatever reason (and yes, I'm aware that a few cars were slated for delivery at one dealership, but were later transferred to another after these lists were printed). We can also see many of the Dealer's original VON numbers... which would have been printed on the original vehicle order sheet from the dealership. For most other vehicles ordered through Chrysler, this order sheet's printed number would have become the car's VON were it not for the 926-927 re-assignment. We can also see which cars were diverted to a Sales Show, and the dealership from which the car was apparently diverted... this information is missing from the Daytona Shipping List (although I've only been able to confirm one such car's eventual arrival at the original ordering dealership shown on this list). We can also confirm several dealer's zone and dealership ID numbers, which can be cross-referenced from the Daytona Shipping List as well... (have to watch for the occasional typo... which is soooooo easy to do since this is a LOT of information and keypunching!!!). This list is also how we've confirmed at least one car's existence on paper that we already knew existed in real life - but was missing from the original Daytona Shipping List (355109). I'm very thankful this information still exists, and it's fantastic that the WW/NBOA printed their spreadsheet summary in the newsletter. It really is good stuff. The 355### cars seen to be well optioned out.And where for NASCAR drivers? I can say for a fact that the original Daytona Shipment List of 385 that surfaced in the late 80s did not have any wing color info on it. There was also a list that contained the rest of the cars from 386 to 501, that surfaced later. It also did not have wing color info. And then a list that did have wing colors?? Was that list an official Chrysler document? Was that list an official Chrysler document? I was told that it was an official Chrysler document, but as mentioned earlier, I have not seen the document itself... only the spreadsheet summarization of its contents as prepared by the WW/NBOA. Perhaps someone can post a little bit of that official document?